The Friends of the El Toro Library is generously participating in Literary Orange 2010 as a Presenting Sponsor. 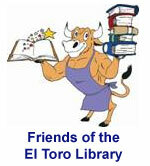 The Friends of the El Toro Library is located outside the El Toro Library at 24672 Raymond Way in Lake Forest. This non-profit organization is dedicated to assisting the library through volunteers and donations. Their donations provide materials, programming, and improvements for the library. Donations and volunteers are always welcome.